Dominica weather is a perfect example of what most people think of when they think of "tropical weather." The weather in Dominica is hot and humid for most of the year with some parts of this Caribbean island receiving almost daily rainfall. Get the latest weather forecast Dominica below. Dominica's spectacular geography consists of towering mountains ranges with lush, pristine rain forests and lower coastal areas with white sandy beaches. This variation in altitude and the rain and heat the island experiences provide a lush tropical island alive with diverse plant life and and beautiful rivers. Weather Dominica: How You Feeling? Hot, Hot, Hot! Dominica has average temperatures in the winter months of 77°F (25°C) and 82°F (28°C) in the summer months. The average annual temperature is 80°F (26.7°C). During the peak tourist season of December through May, Dominica weather is at its most favorable, as it is the coolest and driest time of the year. The average high temperature during this time of year is 87°F (30.6°C) and the average low is 73°F (22.8°C). 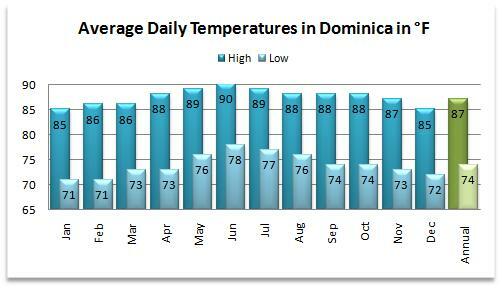 The summer Dominica weather forecast sees steamy temperatures reach average highs of 90°F (32.2°C) in June, but are somewhat eased with cooling Northeast trade winds that provide relief from the heat and humidity. The densely forested regions of Dominica tend to be cooler than coastal areas which are mostly hot but sometimes tempered by the sea breezes. The weather in Dominica consists of a lot of rain. As a result, seasons are not so much based on temperature changes but are based on the wet and dry seasons, though some parts of the island experiences wet weather every day of the year. The wettest month on this Caribbean island is August, while the dry season occurs during the tourist season between December and May. Dominica has an average yearly rainfall of 75 inches (191 cm) per year on the west (Caribbean) coast and 200 inches (508 cm) per year in the inland mountains. In the rain forests of Dominica rain falls daily, which is must to keep the 1,000 plus flowering plant and many rivers and lakes fully fed. All this rain creates a humid and tropical climate year round. Storms tend to pop up quickly on Dominica, especially during Hurricane season, and visitors should always be prepared for a change in the weather. Because this Caribbean island is located in "Hurricane Alley," the Dominica weather is interrupted more often than average by hurricanes. Hurricane season there is July trough October. The island is brushed or hit with a hurricane or tropical storm every four years on average. The last hurricane to affect the island was Hurricane Dean on August 17th, 2007, when it passed about 60 miles to the south of this Caribbean island. The Dominica weather and geography create the perfect tropical island to escape to, especially if you are looking for excursions into pristine rain forests or exploring the many rivers and lakes on the island. Just remember to take along a light jacket and remember to watch out for those quick changes in the weather.